The Vice President, Professor Yemi Osinbajo says he granted authorisation to two ventures from the NNPC while President Muhammadu Buhari was away on medical leave. 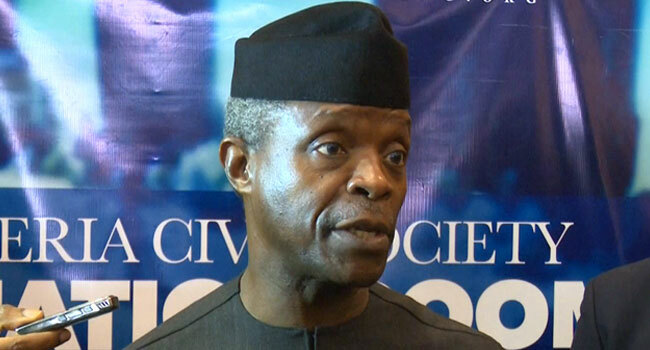 Professor Osinbajo said on Thursday, that the approvals were specifically for financing joint ventures through loans and not contracts. His reaction comes in the wake of the scandal rocking the Nigerian National Petroleum Corporation (NNPC). Earlier, his spokesperson, Laolu Akande, had tweeted that the vice president approved the joint venture financing in his capacity as acting president in July. This comes more than a week after the Minister of State for Petroleum, Dr Ibe Kachikwu, in a letter to President Muhammadu Buhari, accused the Group Managing Director of the NNPC, Dr Maikanti Baru, of insubordination and of awarding contracts without due process. The NNPC GMD, however, denied the allegations insisting that due process was followed and appropriate approval received from the President. Dr Baru’s response led to questions about how the President who was away on medical vacation when some of the contracts were awarded approved them.